Martin’s Tavern in Georgetown celebrates St. Patrick’s Day. Photograph by Scott Suchman. There are two kinds of bars on St. Patrick’s Day: the places that throw a leprechaun on the door and pour green beer for the day, and the real pubs that celebrate with live music, dancing, and traditional Irish food and drink. We’ll celebrate at the latter on Sunday—see a full lineup below. This family-owned Capitol Hill institution is celebrating its 45th year in business with ten days of celebrations culminating on St. Patrick’s Day. Patrons can drop by for Irish whisky tastings each night leading up to the big event this weekend. An all-day party of live music and ballroom dancing starts the pre-game celebration at noon on Saturday, followed by St. Patrick’s Day on Sunday when the doors open at 9 AM and Guinness flows for 45-cents until close. Owner and Tipperary native Mark Kirwan is behind these two authentically Irish gastropubs. For the new Wharf location, he even brought in Irish carpenters to construct the waterfront space with materials from the Emerald Isle. Head over to the waterfront on St. Patrick’s Day for live music, Irish dancers, and Guinness specials. At both you’ll find from-scratch dishes like a stellar Shepard’s pie made with braised lamb or a creamy Dublin coddle (Kirwan’s) or Howth fish cakes (Beckett’s). Old Town is home to a large Irish-American community and several pubs, and this stalwart is among the best. Listen to live music nightly, or sip a stout alongside bangers and mash. On St. Patrick’s Day, doors open at 8 AM (no cover) with live music and Irish dancing all day. 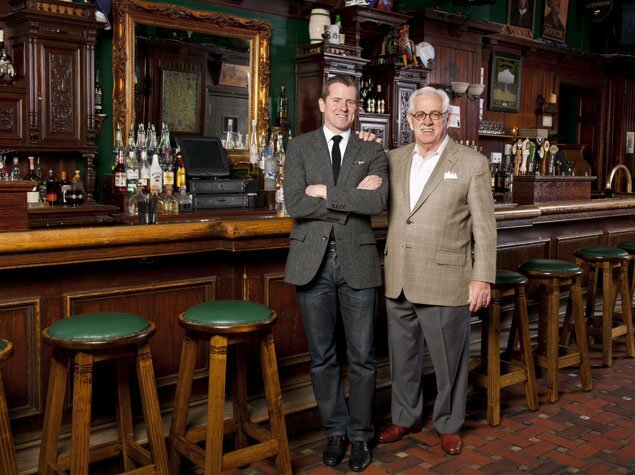 Gavin Coleman and his father, Danny, in the Dubliner, a Capitol Hill institution for over 40 years. Photograph courtesy of the Dubliner. This self-described “quaint, sometimes boisterous” pub near Union Station has served pints and an extensive selection of whiskeys for 40 years. St. Patrick’s Day brings thirsty crowds looking for a good time. Georgetown’s historic pub has been a neighborhood fixture for 86 years and is still run by the Martin family—originally Galway natives. Though the bar/restaurant has played host to several Presidents—the Kennedy “proposal booth” remains a fixture—the place is far from fussy and serves solid (not necessarily Irish) throwbacks like creamed chipped beef, Monte Cristo sandwiches, and weekday brunch. The atmospheric inn is a great place to avoid green beer-chugging crowds and celebrate the holiday with family and friends. 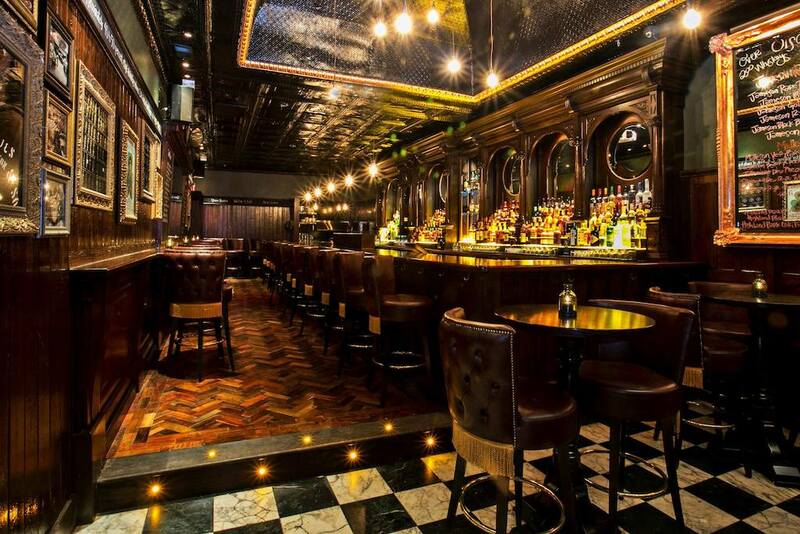 Patrons can sip Guinness at the bar, try dishes like Galway seafood stew, and catch live Irish music and dancing. Arlington’s Irish-owned pub is a great spot for a pint by the fire in cold weather and regularly shows European football (aka soccer) matches or has live music for entertainment. St. Patrick’s Day celebrations start early on Wednesday with a Guinness and oyster fest, and continue into the weekend with the Four Courts Four Miler on Saturday and party on Sunday that flows out to a heated tent. Georgetown’s atmospheric Irish bar is filled with artifacts from the owners homeland, including a Victorian-era bar salvaged from Cork. The menu has some cheffy touches (i.e. lamb poutine) and the bar boasts a huge selection of Irish whiskeys, but the place isn’t too fancy for an all-day full Irish breakfast. On St. Patrick’s Day the doors open at 11 AM for a day of live music, dancing, drink specials, and more. Ri Ra in Georgetown was built with decor from the owner’s native Ireland. Regulars can relax by the fire or play darts at this suburban pub. While there are plenty of traditional Irish dishes on the menu, the place also caters to the meatless crowd with vegan “bangers” and chips. St. Patrick’s Day weekend includes festivities on Saturday and Sunday (the latter is 21+ only, and doors open at 10 AM for kegs n’ eggs). This is a traditional Irish spot for all seasons, equipped with a large patio for sipping Smithwick’s in summer and a live fireplace warming the room in winter. Comfort fare goes year-round with plenty of sausages, savory pies, and stews. Doors open at 10 AM on St. Patrick’s Day ($10 cover) with live music and specials all day long. This gathering place in downtown Silver Spring comes from Irish-born owners, and the menu boasts a few less-common finds like an Irish “boxty” (potato and cheddar cake), Wexford lamb stew, and colcannon (mashed potatoes with cabbage). Though St. Patrick’s is a music-filled day, every Tuesday brings traditional Irish players to the pub. Drop by for all-day Irish breakfast at this stalwart pub, which opens at 9 AM on St. Patrick’s Day for hours of live music and dancing. The menu includes some lesser-seen Irish dishes in these parts like Kerry lamb stew. Chinatown’s long-time Irish bar is a good spot to catch a rugby match or try seasonal Irish specials like curried fisherman’s pie or lamb stew with Guinness cheddar bread. The doors open at 10 AM on St. Patrick’s Day with live music starting at 2 PM ($10 cover at 1 PM onwards).